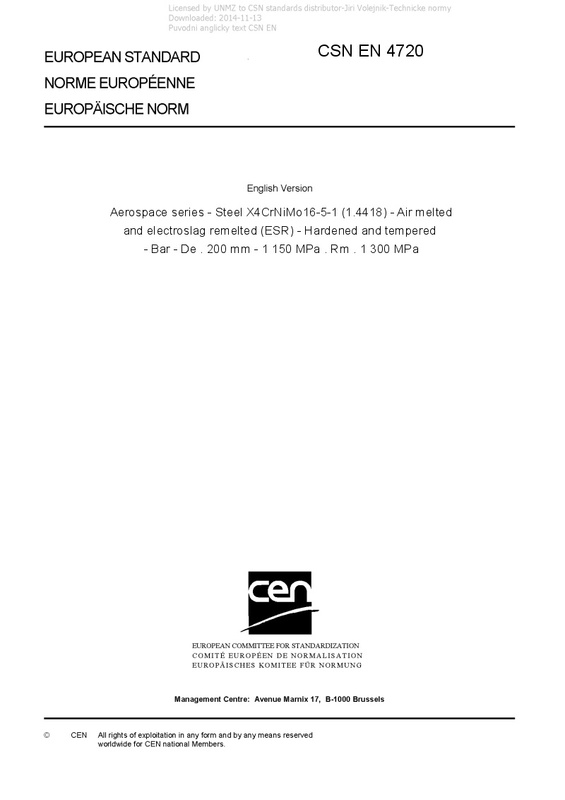 EN 4720 Aerospace series - Steel X4CrNiMo16-5-1 (1.4418) - Air melted and electroslag remelted (ESR) - Hardened and tempered - Bar - De . 200 mm - 1 150 MPa . Rm . 1 300 MPa - This European Standard specifies the requirements relating to: Steel X4CrNiMo16-5-1 (1.4418) Air melted and electroslag remelted (ESR) Hardened and tempered Bar De ? 200 mm 1 150 MPa ? Rm ? 1 300 MPa for aerospace applications. NOTE Other common designation: AIR: Z 8 CND 17-04.